Is this your first plantar fasciitis experience? Does yours come and go? Either way, the FUTURO night plantar fasciitis sleep support adjustable splint may be a good investment. This night splint is a middle-of-the-road product price-wise, one that is relatively inexpensive yet can help reduce and possibly even eliminate plantar fasciitis pain for most people. This particular night splint is what I used when I first encountered fasciitis pain. Fortunately for me, my son-in-law had taken this splint with him on our vacation because, as a runner, he had been struggling with plantar fasciitis pain for several months. The Futuro night splint is an adjustable dorsal-style splint. Dorsal style means that the hard plastic portion of the splint runs along the top of your foot and your shin. This type of splint is less bulky than a boot-style splint. It is made of 60% polypropylene but also contains polyurethane foam, polyester, nylon, TPE (thermoplastic elastomers), and spandex. Note that this product can be shipped to select countries outside the U.S. Since the straps around your leg and your foot can be adjusted to some degree, the splint can be made to better fit your foot. It is about 12 inches total in length, curved into the shape of an “L”. About four inches covers the top of your foot, the remainder goes up your leg. Depending on the size of your feet and legs the “fit” could vary significantly. This is where the adjustable straps come into play. The strap at the top fits around your leg. It can be moved up or down to achieve the best holding position and is long enough to wrap around a calf that is up to 18-24 inches in circumference. Likewise, the foot strap can be moved forward or back to allow for slightly different placement. It can wrap around your foot anywhere from the ball of your foot to your toes. Since the splint is about 3.9 inches wide you may find this night splint to be too tight if your foot is more than 4 inches in width. Normally, when you sleep, your foot tends to droop downward. This increases the angle between your foot and leg and causes the plantar fascia to contract. When you get out of bed and try to take a step, your contracted fascia suddenly gets stretched and then weight is placed on your foot. 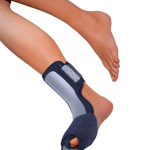 The design of this night splint is intended to hold your foot in a recommended therapeutic position comfortably all through the night. This recommended position forms a 90 degree angle (called “dorsiflexion”) with your leg, just as if you were standing up. It keeps your plantar fascia stretched during the night, allowing you to wake up and take your first step of the day without the normal overbearing heel pain associated with plantar fasciitis. Maintaining a 90 degree dorsiflexion during the night provides another benefit. Both your Achilles tendon and your calf muscles will continue to be stretched. Similar to the plantar fascia, when you sleep without a night splint or some similar positioning instrument your Achilles tendon and calf muscles will drift into a nonfunctional state. In this nonfunctional state they start to tighten. When you first get out of bed these tendons and muscles may not be ready to function properly. Calf muscles and the Achilles tendon are often noted as playing a potential role in the development of plantar fasciitis pain. They become stressed by overuse, major changes in activity, standing too long, poor shoes, being overweight and by several other things that also can cause fasciitis. Continuing to stretch the tendon and muscles during the night will help eliminate them from the what-is-causing-this-pain equation. The Futuro splint is made of lightweight materials. As noted previously, it is relatively small, making it very portable when you travel. My son-in-law just packed it in his suitcase – and he travels light. It is also designed to be worn on either foot so there is no need to pack two of them (unless both feet need help, of course). You can choose to wear it with or without socks – your choice! The wraparound style of the straps makes this splint easy to put on. It’s also very easy to take off. To clean your Futuro night splint simply remove the leg and foot straps from the hard plastic shell. Hand-wash the parts with mild soap in warm (not hot) water. Rinse them well and then air dry the fabric components and towel dry the plastic component. Do not use a washing machine to clean them, tumble dry them in a dryer, or take them to a dry cleaner. Also, do not use fabric softener or bleach when cleaning the parts. Perhaps the biggest drawback is simply that wearing something on your foot at night may not feel normal. For some, it may be described as uncomfortable just for this reason. For others, it may just take some time to get used to wearing it. Since using the product is relatively straightforward there are no instructions sent in the packaging. Some caution must be taken to ensure that the splint is worn properly. If not, it could cut off circulation to the foot. A little bit of research could alleviate this issue! The night splint is not intended to be used as a walking boot. It is not designed to bear a load. Since I am not a health care professional, I ask that you please consult with your doctor before using this product on a regular basis. If your pain level is minor, this product alone might do the trick and relieve the pain. 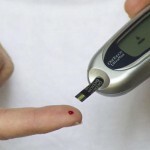 If your level is more severe, however, then this product will probably be included as part of a larger program that is recommended by your doctor. If pain or discomfort results from using the splint, or if it persists or increases, then stop using the product and talk to your doctor regarding any further use. The average customer rating of 25 customer reviews on the Futuro site was 4.1 out of 5. On Amazon, the average ranking in 277 reviews was 3.4 out of 5. 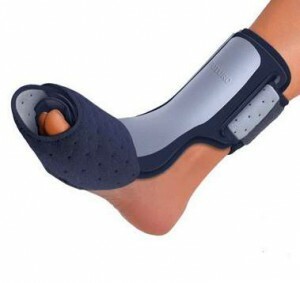 Many reviews stated that the customer had found relief from all or a large portion of their foot pain after only one night of wearing the splint. Speaking for myself that is what happened when I used the splint the first time. I wore it 3-4 nights and then was able to go without it. Some of the key pluses stated by consumers of this product included: easy to use, comfortable, effective, stabilizes, not as bulky as wearing a night boot to bed, meets expectations, and great value. Uncomfortable (this response could be from individuals who couldn’t get used to wearing it while sleeping or they had it too tight). Splint provided little support or didn’t work. The straps did not keep the foot at a right angle all night long. One size splint did not work for all sizes of feet (feet that were too small had problems with foot slippage and those too large did not fit into the splint). Eventually, if used regularly, the velcro wore out the fabric on the straps so a replacement item had to be ordered because the straps could not be purchased individually. As with any post on this blog, please feel free to ask a question or leave feedback related to your experiences with this product. Your email will not be published. Note that the name and email fields are required to submit a comment/question. Please use the comment area below to provide feedback. Just a heads up. I do make a small commission on some of the products and services that I use and recommend through affiliate relationships with those merchants. Also before making any purchase you should always rely on your own judgement and do your own due diligence. The results you get will be entirely based on your own experience and skill set. There is no guarantee that you will have the same success with any of the products or services recommended. I have had this plantar fasciitis pain and it is extremely difficult to move around, especially when getting up in the morning. The product you have endorsed seems to be a good device and would reduce the pain considerably for sleeping and starting movement in the morning until it warms up. 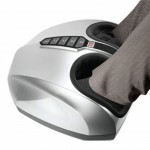 I see how it works effectively by keeping the Achilles tendon and calf muscles stretched. I will recommend this splint to my husband. Thanks Christine. I know it worked well for both me and my son-in-law. Even though I’m not specifically suffering with pf pain at this time, I occasionally feel some pain in the bottom of my foot during the night because my foot muscles relax. When I feel it, I usually try to lift my toes and stretch the plantar fascia tissue. If the pain continues I can use the splint to help relieve it. 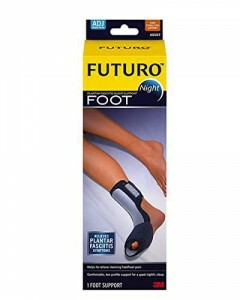 The Futuro night splint seems like a great solution for plantar fisciitis pain. I know that I’ve had foot pain at times when I would start working out or when I’d start a new running regimen. Braces, splints, and other products prove invaluable for many people who experience pain on a regular basis. Thank you for this review, the Futuro product looks like it does its job well. I appreciate your response, Bryan. It sounds a lot like what happened to my son-in-law, a runner like you changed his running regimen and developed plantar fasciitis. 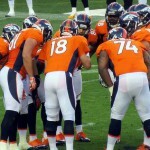 This is a good article, very informative and easy to understand. I am glad that I had found this site while searching the net. I notice that my father had this problem 1 month ago after coming back from work. It had been causing pain to him and at times become a little grumpy. Thanks for the info and I will definitely buy it for my father. I’m glad to know my site can be of help to your father, Lucas. PF is more common as people get older (I was in my early 60s when I first got it), as well as in athletes. The workplace may be especially tough on your father’s feet if he is standing a lot or wearing hard-soled shoes all day. If you haven’t seen this post, take a look: What is Plantar Fasciosis? I do hope the night splint will help relieve some of the pain. Very informative website. Very easy to navigate and find out the information you’re looking for. Plantar fasciitis is a very serious issue especially for athletes and people in general that are always on their feet. One of the kids on the football team has been complaining about is heel. I’ll have to refer his parents to your website. Thanks for your comment, Hellen. Please do have the parents take a look. In particular, they might want to read through my post entitled Parents Take Notice – Heel Pain and Children are Not a Good Mix (which is aimed at parents of teens as well as younger children).